Artist rendering of the the proposed Puerto Rico Resource and Renewable Energy Project in Arecibo. Rochester, MA — Puerto Rico residents generate between 11,000 and 12,000 tons of waste, or about five pounds per person, every day that goes straight to the island’s landfills. However, through the proposed Puerto Rico Resource and Renewable Energy Project, that habit can change and what is considered waste today could be recycled as fuel in the near future. 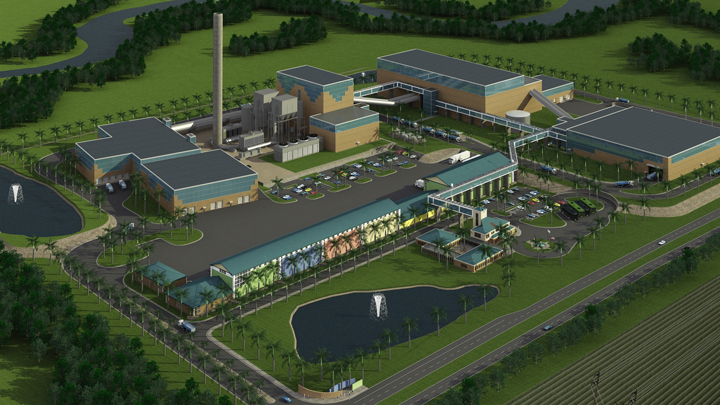 In about six months, construction of the first plant capable of receiving up to 2,100 tons of waste per day to convert it into biofuel will begin in Arecibo. The proposed $500 million waste-to-energy plant owned by Albany, NY-based Energy Answers would generate 80 megawatts of energy and would create some 150 new ‘green collar’ permanent jobs. This reporter recently got the opportunity to travel to the South Eastern Massachusetts waste-to-energy facility in Rochester, which for the past 20 years has been using the same technology that would be installed at the Arecibo plant to address the island’s mounting solid waste problem. The SEMASS plant collects more than 3,000 tons of waste on a daily basis. Under strict U.S. Environmental Protection Agency standards, and the watchful eyes of neighbors and farmers, the plant recovers, recycles and composts the waste to draw non-polluting fuel. The Northeastern plant produces 12 million megawatt hours of electricity, industrial steam, has recovered more than 700,000 tons of ferrous metals and 60,000 tons of non-ferrous metals, and recycles thousands of gallons of waste sludge. This operation uses regulated solid waste to maintain a clean environment. “The technology used in this resource recovery facility consists of recycling, composting and reusing. With garbage there are only two options, to deposit it in a landfill or use it as a fuel and recycle more material. But a landfill is a waste of space,” Mahoney added. The first step in the waste-to-energy conversion process consists of reusing, recycling and composting solid wastes. Most of the materials used in homes have a second use, others have to be deposited in the trash. In the case of the resource recovery plant, materials that aren’t recyclable are processed. The remaining material is then used to produce biofuel. Waste is shredded to facilitate the burning process. When it becomes ashes, it has to be stabilized using lime based mineral obtained from landfills. The next step consists of generating clean energy as the fuel goes through three boilers, which generate water vapor to produce energy. It can also generate ash, which must be disposed as a sanitary filing. “The burn is done in an efficient manner without making big smoke to maintain the highest level of control,” she said. Gas emissions produced during the process of creating fuel go through sophisticated filters, reducing contaminants to the environment, company officials said. After the combustion process, ferrous and non-ferrous metals are recovered, and aggregates can be used in other industries. The EPA requires continuous emissions monitoring that produce computerized daily reports. Since its establishment in 1991, the SEMASS facility has processed more than 20 million tons of waste. Interestingly, coins found in the process of sifting the material are returned to the U.S. Treasury Department. To date, that amount tops out at about $1,000 a day. 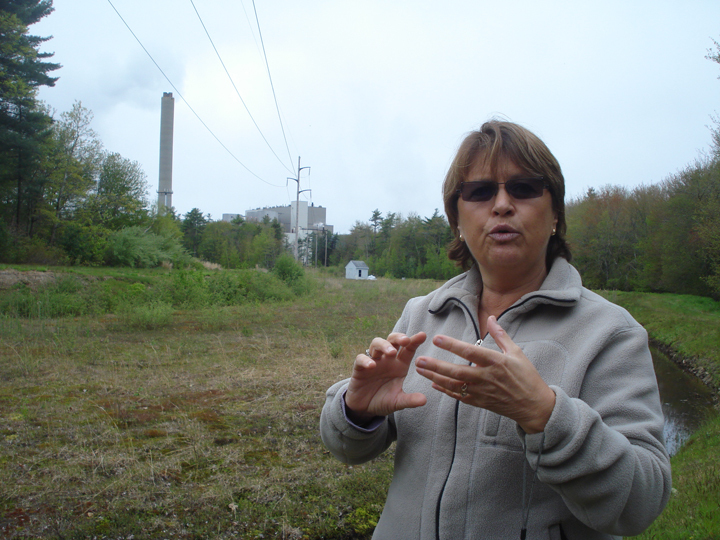 During the trip to the facility, this reporter also spoke to cranberry farmers working next to the operation who said the SEMASS complex has not caused problems to fruit crops near the plant or upon the health of the neighbors, said farm owner Brad Morris. That information is relevant to the island, as the proposed plant would be located in a town anchored by farming. Meanwhile, information provided by the Plymouth County Directorate of Public Works shows that the annual average of solid waste generated by some 11,552 families at three transfer stations is 11,782 tons. The solid waste delivered to those transfer stations benefits both the town and the SEMASS plant, as residents have to pay an annual fee to dispose of their trash. That money, or about $1.9 million, is used for education programs. The waste not processed at the transfer stations is sent to SEMASS for recycling, to generate fuel that is subsequently sold to the state’s power authority. At present, 64 percent of the recyclable material is obtained from Plymouth county. In Puerto Rico, Energy Answers would sell 70 of the 80 megawatts of the energy it would produce to the Puerto Rico Electrical Power Authority, at a reasonable cost. But because EPA’s regulations are strict, only 20 percent of solid waste generated on the island can be used in waste-to-energy projects. At present, there are about 30 landfills on the island, most with limited lifespans left. So, it would seem that the private initiative proposed for Arecibo, which requires no government financing for its construction or operation, would be a reasonable solution to the looming problem. The veteran environmentalist added that this recycling operation would lessen the island’s reliance on its limited landfill space and reduce the impact on water, land and air resources. Hi Michelle and Melissa. Great article. I will publish the link in the Facebook page of Miprv.com. I think one are that causes confusion in Puerto Rico is that many people still see the waste to energy technology as incineration, which has not been used for a long time. It’s good to get some perspective on this issue, which will surely heat up in the coming months. Michelle, gracias por este reportaje. Es motivador ver que finalmente lleguen a nuestra Isla alternativas que realmente ataquen el problema de los desperdicios y a la misma vez aporten a generar energia de una manera limpia. Solo espero que el proceso no sea contaminado por terceras personas y comencemos a disfrutar de sus beneficios. Thanks to all of you. We will be publishing environmental/business related stories more frequently, as this is an issue that is largely unreported (with the exception of my friend José Maldonado) and needs definite attention. Michelle, a couple of months ago the local gov. announced an initiative to pave roads with a mix of rubber from recycled tires. I’ve never heard of it again. In Arizona such product is largely use to excellent results. There are major errors and omissions in this article: construction is not going to start anytime soon. No reference is made to the fact that without EPA approval nothing of the sort can be built on the site which is a floodway and in a tsunami zone. EPA is currently evaluating Energy Answer’s (EA) proposal. The original application, submitted around the beginning of this year) was found to be incomplete and defective. EPA required additional information and clarifications to the application. EA was notified of this. Once EA re-submits and answers EPA’s extensive request for clarification then they can commence the formal evaluation process within EA. EPA in a public presentation to the community in Arecibo, just days when EA submitted their incomplete application, officially explained the process to the community. EPA has no deadline to complete the evaluation–it can take a year of more. Prior to them issuing a decision, a preliminary notice will be publicly issued. Again, the community will have an opportunity to comment. Only after this normal process is conducted can EA start construction if, and only if, EPA grants a permit. Furthermore, there is no comparison with the plant built over 20 years ago in Rochester, MA. That plant was not built on a floodway (in contrast to a flood zone). The plant obtained its original permits when it was first built. The incinerator proposed for Arecibo is to be built with higher standards set by EPA and applicable now. Other omissions in the article include, but are not limited to, the fact that proposed site in Arecibo is near already heavily contaminated areas (including mercury on the soil from a battery recycling plant), the air quality is already compromised by an existing oil-burning power plant. Both of these existing conditions are currently in violation of EPA air-quality, clean water, and other requirements. Rochester, MA may not have the high incidence of asthma that the Arecibo region has. The Arecibo community and beyond who oppose this plant is full aware of all the pros and cons such a facility may offer–except the cons overwhelmingly trump any pros. Rochester, MA does not have, for example, a fresh water retention pond within 2 miles of the plant–the same fresh water pond from where 500,000 people in San Juan metro area get fresh water via an existing 50 mile aqueduct. IN other words the incinerator in Rochester, MA is nowhere near the fresh water that the population of Boston drinks. The article does not mention that no new incinerators of the same type being proposed by EA for Arecibo have been built in the US (nor its jurisdictions) since 1995. The principles of Environmental Justice are applicable in Arecibo, and EA’s proposed incinerator will simply exacerbate an existing local problem that is well documented. Poor communities should not be the dumping ground for an accumulation of toxic material, poor air quality, and lack of informed citizens. We are certain that Rochester,MA does not have a comparable set of facts and circumstances to Arecibo. To compare the existing Rochester, MA, incinerator built over 20 years ago to a new proposed incinerator for Arecibo, PR is to compare apples and oranges. Perhaps the reporter can visit Arecibo, walk the proposed site, interview the community and then report on the other side of the story. The Arecibo community at large is not just the immediate neighbors, it also consists of scientists, doctors, school children, parents, elected officials, and many others who oppose this incinerator on solid grounds, facts, and evidence. Hey Buddy!, I found this information for you: "Proposed 0M waste-to-energy plant in Arecibo would adopt U.S. methods". Here is the website link: https://newsismybusiness.com/proposed-500m-waste-to-energy-plant-in-arecibo-would-adopt-u-s-methods/. Thank you.